Integrate your Selenium test suite with Jenkins and the BrowserStack Selenium grid using our plugin. 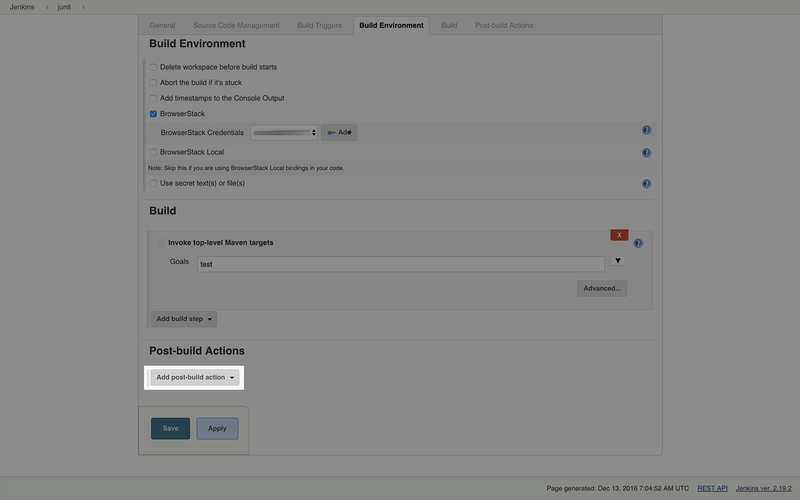 Jenkins is an open-source Continuous Integration (CI) server, which automates the build and deploy process of your web applications. 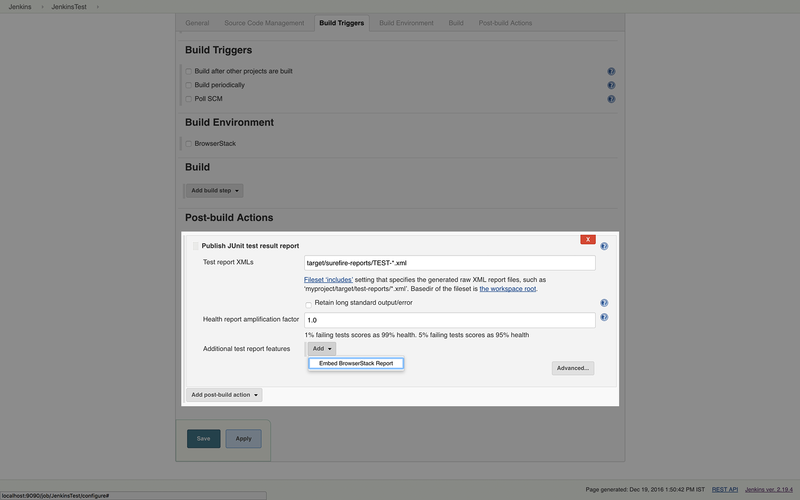 By running your Selenium test suite in Jenkins, you also automate testing as part of the build process. Add BrowserStack to the mix, and your web apps can be tested across 2000+ real devices and desktop browsers. 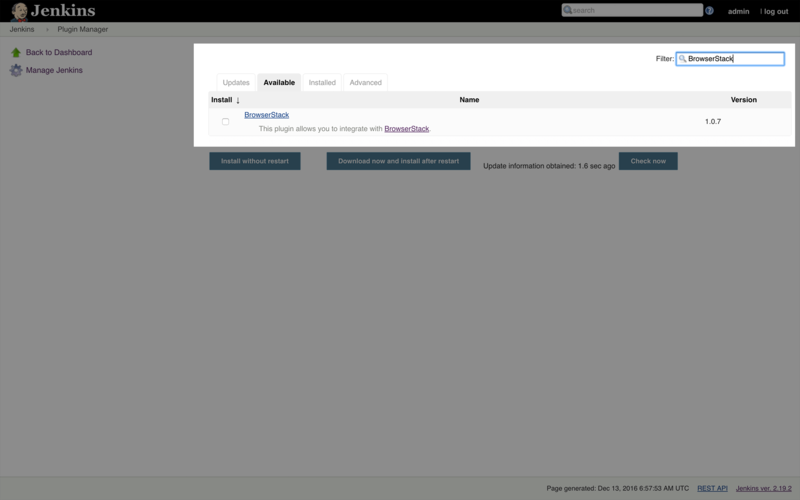 BrowserStack lets you integrate your Selenium tests with Jenkins using a plugin that connects your Jenkins CI server to the BrowserStack Selenium Grid. 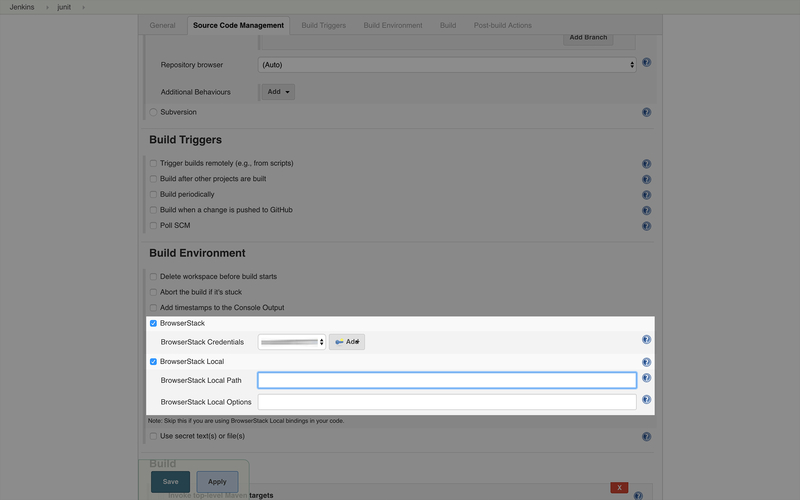 Configure your BrowserStack credentials for your Jenkins jobs. Set up and tear down the BrowserStack Local binary for testing internal, development and staging environments. Embed BrowserStack test results, including video, logs, and screenshots in your Jenkins job results. To run your Selenium tests with Jenkins on BrowserStack, you will first need to download our Jenkins plugin. Before installing the plugin, ensure you have the necessary privileges to administer your Jenkins installation. We recommend doing this when there are no active build jobs running on Jenkins. Click on Manage Jenkins > Manage Plugins. Click on the Available Plugins tab. In the search box type BrowserStack. Choose BrowserStack from the list of available plugins. Check the box and install the plugin. Once the plugin has been successfully installed you will be able to see it in the list of Installed plugins. Note: If the BrowserStack plugin doesn’t show up in the list of Available plugins, click on the Check Now button to force Jenkins to pull the latest available plugins from Jenkins update center. Once you've installed the plugin, you will need to configure your BrowserStack credentials to complete the integration between Jenkins and your Selenium Webdriver tests. This can be done by either using Jenkins UI or using a Jenkinsfile. 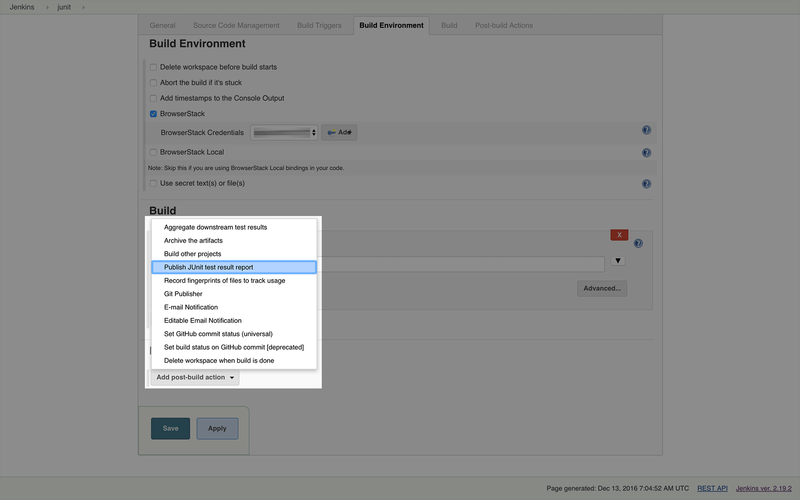 Go to Manage Jenkins > Configure System. Enter your BrowserStack Username and Access Key which you can find on your BrowserStack Account Settings page. 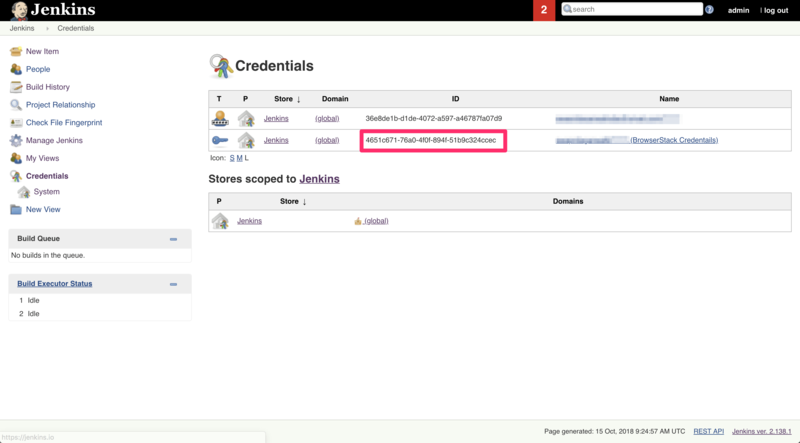 Once you add your credentials as mentioned in the above section, Jenkins generates an ID which is used in the Jenkinsfile. From the Jenkins home page, click on Credentials from the left menu. You can copy the ID for BrowserStack credentials. 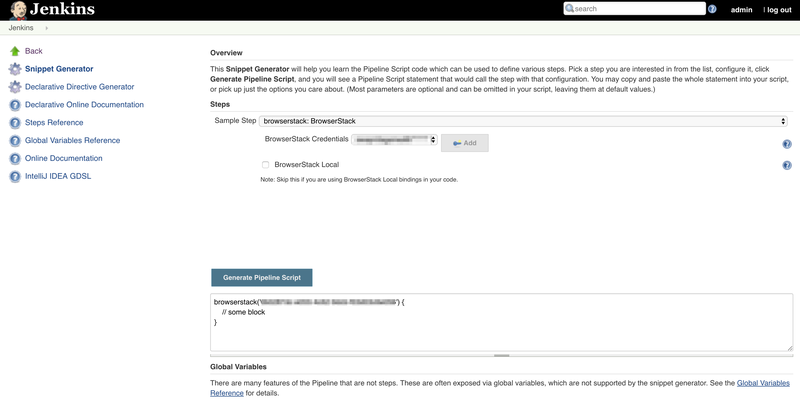 The above Jenkinsfile code block can also be generated with the help of Pipeline Syntax generator tool available in Jenkins. Use the dynamically populated area below the Sample Step dropdown to configure the selected step. Click Generate Pipeline Script to create a snippet of Pipeline which can be copied and pasted into a Pipeline. Setting up and tearing down the secure tunnel. Note: BrowserStack Local can only be configured per job and not via global configuration. Note: You must pass browserstack.local and browserstack.localIdentifier capabilities to test on your local development servers. 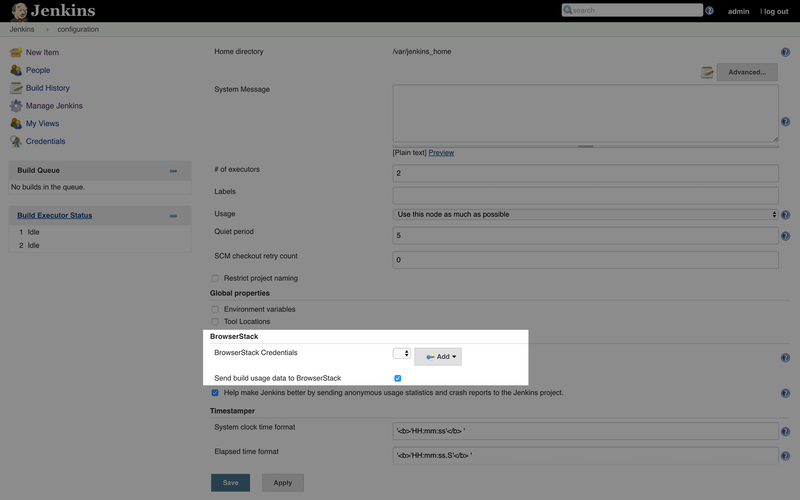 Under the Build Environment section check the box next to BrowserStack Local. If you are using an externally downloaded binary, you can enter its location at BrowserStack Local Path. If left empty, the plugin will automatically download the binary (recommended). This is recommended especially if you are using Jenkins in master-slave configurations, since the plugin will download the appropriate binary for the build agent OS. Once you've integrated BrowserStack Local through the Jenkins plugin, you can run your Selenium tests on websites hosted on private, development, and internal servers safely and securely. If you are using an externally downloaded binary, you can enter its location at localPath. If left empty, the plugin will automatically download the binary (recommended). This is recommended especially if you are using Jenkins in master-slave configurations, since the plugin will download the appropriate binary for the build agent OS. Use localOptions to set any additional configuration options when running the binary (Full list of options available here) Once you've integrated BrowserStack Local through the Jenkinsfile, you can run your Selenium tests on websites hosted on private, development, and internal servers safely and securely. 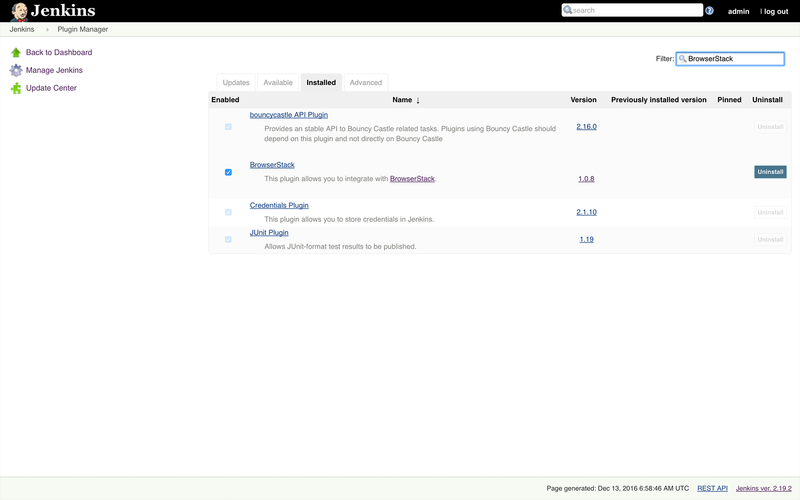 The BrowserStack Jenkins plugin enables you to embed the test results from BrowserStack into Jenkins. We currently support viewing test reports in Jenkins with a select set of languages and frameworks, which are Java with JUnit/TestNG, and Node with Protractor and WebdriverIO. The sections below describe how to embed your BrowserStack test results in Jenkins. A prerequisite for embedding test reports is that the Java project must be built with Maven and use either TestNG or JUnit for testing. You must define the Maven properties, jdk.source.version and jdk.target.version to match the Java versions of your project. Add wdio-browserstack-reporter as a dependency in your package.json file. Add browserstack as a reporter in your conf file. outputDir (optional): defines a directory location for storing browserstack report files. Here is the link for the GitHub repository. Add protractor-browserstack-reporter as a dependency in your package.json file. Add browserstack as a plugin in your conf file. Please make sure that JUnit plugin is installed in Jenkins. The below steps for embedding test reports are same for Java - JUnit and TestNG, Protractor and WebdriverIO. Once you have completed the steps above, you can configure your Jenkins CI server to embed all the BrowserStack Selenium reports and logs in Jenkins. Click on Add post-build action in Post-build Actions. In the Additional test report features section, add Embed BrowserStack Report. With this integration, you can now view the results of your Selenium Webdriver tests within Jenkins. This is a post build step and should be added after browserstack block in the Jenkinsfile. With this integration, you can now view the results of your Selenium Webdriver tests within Jenkins. By following the steps outlined in this guide, you should have a seamless integration between your existing automation in Jenkins, your Selenium tests and the BrowserStack Selenium grid. This will help you leverage all the benefits of test automation and the scale and coverage offered by BrowserStack.